Does Protein Increase the Risk of Heart Failure? | Less Likely Does Protein Increase the Risk of Heart Failure? A recent study published in Circulation showed a relationship between increased protein consumption and the rate of heart failure. In this blog post, I take a quick look at that study and offer my thoughts. About three weeks ago, a cohort study was published in Circulation that claimed that protein consumption was associated with heart failure. The press reacted as I expected them to. If you read some of these articles, most of them seem to conclude that a high protein diet is probably not good for you and that Americans eat too much protein. Anyway, back to this study. 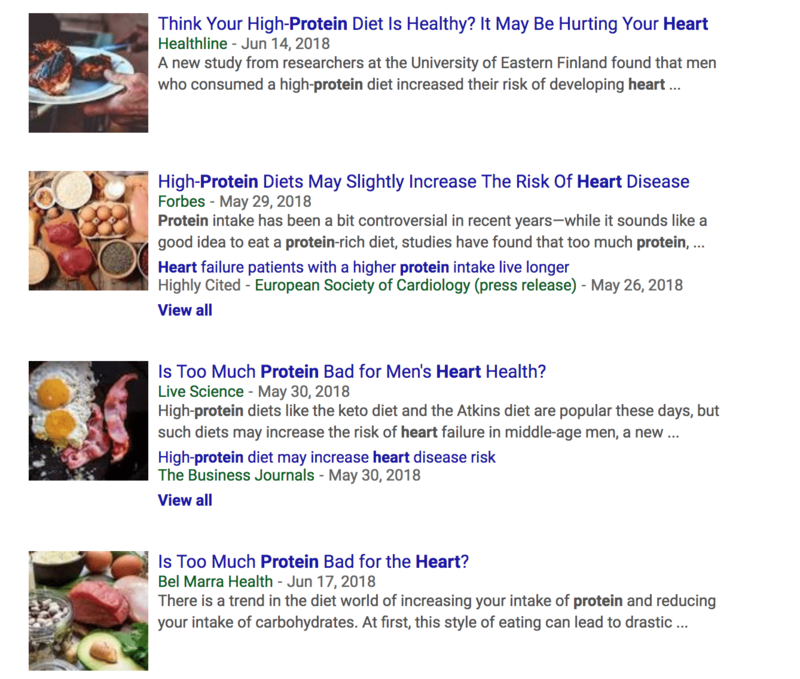 Given the nature and limits of these types of studies (you can read more about that here) I was a bit skeptical, but also open to the idea that there might be a possible relationship between increased protein consumption and an increased rate of heart failure. So, I dove into the study and wanted to discuss. The study was a multi-cohort study where researchers randomly selected and enrolled about 2,600 Finnish men from 1983-1989. In this period (baseline), the participants were required to come into the lab to give blood samples in a fasted state and to report what foods they ate and how much of it they ate from the last four days using a food record. The authors reexamined the participants 4, 11, and 20 years after baseline. They determined whether a participant experienced heart failure by checking national registries and looking for specific diagnostic codes. The participants were categorized into four quartiles based on their protein consumption. The lowest quartile was used as the reference group (AKA the null value). The researchers used a Cox Proportional Hazards Model and selected covariates to include in their model based on the potential risk factors for heart failure noted in the literature. They adjusted for several covariates which include age (y), examination year, and energy intake (kcal/d), education (y), income (euros/y), pack-years of smoking (packs smoked per day×years smoked), alcohol intake (g/wk), leisure-time physical activity (kcal/d), body mass index (kg/m2), family history of coronary heart disease (yes/no), diseases (coronary heart diseases or use of cardiac medications, diabetes mellitus, or hypertension) at the baseline and during the follow-up, and intakes of saturated (g/d), monounsaturated (g/d), polyunsaturated (g/d), and trans fatty acids (g/d) and fiber (g/d). Note: There is always a problem with adjusting for too many covariates, see here. Regardless, the model that included all of these covariates with the largest effects is the one I’m focusing on. Total Protein: When it came to total protein consumption, the highest quartile, which ate about 109.1 g/d of protein, had a 33% (95% CI: 1.33 (0.95–1.85)) higher rate of developing heart failure than the reference group (the lowest quartile) which ate about 78.4 g/d of protein. Animal Protein: The quartile that ate the most animal protein (82.2 g/d) compared to the reference group which ate (49.2 g/d) had a 43% (95% CI: 1.43 (1.00–2.03)) increase in the rate of heart failure. Dairy Protein: The quartile that ate the most dairy protein (40.8 g/d) compared to the lowest quartile (17.1 g/d) had a 49% (95% CI: 1.49 (1.06–2.09)) increase in the rate of heart failure. Fermented Dairy: The highest quartile ate about (22.7 g/d) compared to the reference group which ate about 1.4 g/d. The former had a 70% (95% CI: 1.70 (1.21–2.40)) increase in the rate of heart failure when compared to the reference group. Other Fermented Dairy: The fourth quartile (14.0 g/d) had a 54% (95% CI: 1.54 (1.10–2.16)) increased rate of heart failure compared to the reference group (-0.4 g/d). The most interesting thing to note here is that a lot of the Hazard ratios for the other protein categories were not that much larger than the reference group. The exceptions are the ones above, especially dairy products. The group that ate the most fermented dairy had a 70% increase in the rate of heart failure. This is a bit astounding because most of the scientific literature to date seems to show that dairy products (fermented & nonfermented) result in improved health outcomes or neutral effects, usually on various surrogate outcomes. Here are some studies I found from a quick skim of the literature. Though it’s not very comprehensive or systematic. Yogurt and Cardiometabolic Diseases: A Critical Review of Potential Mechanisms. I think the results provided by this study are interesting and give us an area to further explore. I’m not very concerned by the results of this study because the effect sizes are not that large and indeed could be a result of random error. The idea of fermented dairy possibly leading to an increased rate of heart failure seems a bit sketchy to me. I’m entirely open to the idea, but there don’t seem to be any plausible mechanisms as to why this would be the case. It would also be interesting to see how the magnitude of effects would change if the authors tried to explore all possible models using their covariate selection and reported the median of those analyses, as discussed here by John Ioannidis. I think this would provide us with a lot more useful information and help us avoid the problem of selective reporting. "It is often suspected that selective reporting abounds, i.e. several models are tested and only those with the most impressive results are presented with particular attraction for nominally significant results. There are ongoing efforts to enhance transparency, improve reporting, and reveal whether models are pre-specified, and if so, how. We suggest that instead of presenting a single effect and p-value for an association of interest, one can present the median effect, the median p-value, the RHR and the RP across all possible analyses using different adjustments in addition to the pattern of the VoE, whether a Janus effect exists, and whether there are clear multimodality (and if so, due to what)." Anyway, fermented dairy is delicious, and this study doesn’t fit my mental schema, so I am going to discount it.